Benjamin Graham taught that Intelligent Investors must do a thorough fundamental analysis of investment opportunities to determine their intrinsic value and inherent risk. This is best done by utilizing a systematic approach to analysis that will provide investors with a sense of how a specific company compares to another company or by reviewing 5 Undervalued Companies for the Enterprising Investor. By using the ModernGraham method one can review a company’s historical accomplishments and determine an intrinsic value that can be compared across industries. What follows is a specific look at how Netflix Inc. (NFLX) fares in the ModernGraham valuation model. Company Profile (obtained from Google Finance): Netflix, Inc. is an Internet television network with more than 33 million members in over 40 countries. In the United States, the Company’s subscribers can receive standard definition digital versatile disc (DVDs), and their high definition successor, Blu-ray discs (collectively DVD), delivered quickly to their homes. The Company operates in three segments: Domestic streaming, International streaming and Domestic DVD. Domestic and International streaming segments derive revenues from monthly subscription services consisting solely of streaming content. The Domestic DVD segment derives revenues from monthly subscription services consisting solely of DVD-by-mail. Netflix is suitable for Enterprising Investors but not for Defensive Investors. The Defensive Investor has significant concerns regarding the low current ratio, the lack of dividend payments, and the exceptionally high PEmg and PB ratios. The Enterprising Investor is willing to accept more risk, though, and is only concerned with the lack of dividend payments. As a result, Enterprising Investors following the ModernGraham approach based on Benjamin Graham’s methods should feel comfortable proceeding with further research into the company and its competitors. From a valuation side of things, the company appears to be very significantly overvalued after growing its EPSmg (normalized earnings) from $1.96 in 2010 to only an estimated $2.22 for 2014. This low level of demonstrated growth is in stark contrast to the market’s implied estimate of 73.36% earnings growth and leads the ModernGraham valuation model to return an estimate of intrinsic value that is way below the market price. The next part of the analysis is up to individual investors, and requires discussion of the company’s prospects. What do you think? 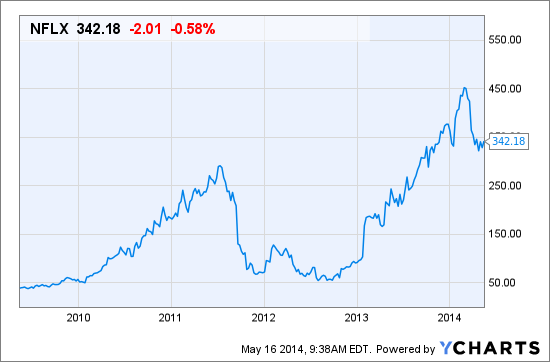 What value would you put on Netflix Inc. (NFLX)? Where do you see the company going in the future? Is there a company you like better? Leave a comment on our Facebook page or mention @ModernGraham on Twitter to discuss. Disclaimer: The author did not hold a position in Netflix Inc. (NFLX) or in any other company mentioned in the article at the time of publication and had no intention of changing that position within the next 72 hours.